I hate that question because I just can’t discriminate food or place one type on a higher pedestal! Food from all over the world belongs in my belly! It’s surprising how many times I have been asked this question and instead of going on this very rant I fall back to my mom’s salsa recipe. 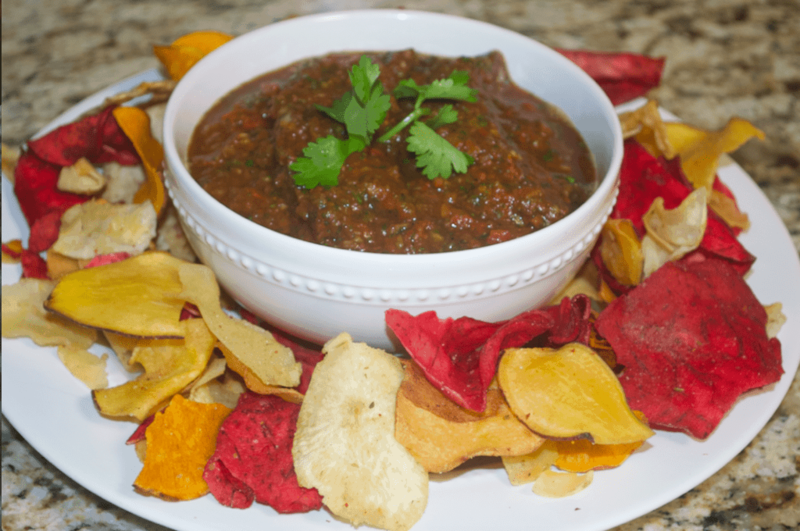 I love her salsa because no matter what time of year it is, Mexican food is always on season! This easy homemade salsa recipe is honestly so good and simple that I probably shouldn’t share it. But my mom gave me permission so if you happen to stumble upon this little corner of the web, you will be delighted on how yummy and fresh this salsa tastes. It is great for your family’s stay-at-home taco Tuesday, delicious on top of eggs and well, nearly everything! 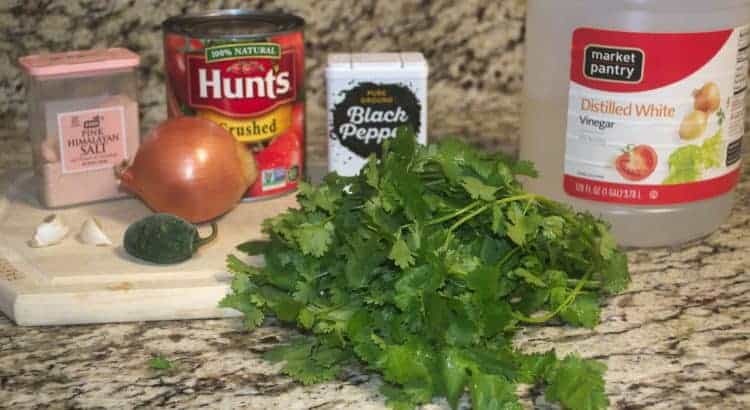 For this recipe you will need to gather cilantro, onion, garlic and jalapeño as fresh ingredients. It is not imperative that all the ingredients are fresh. 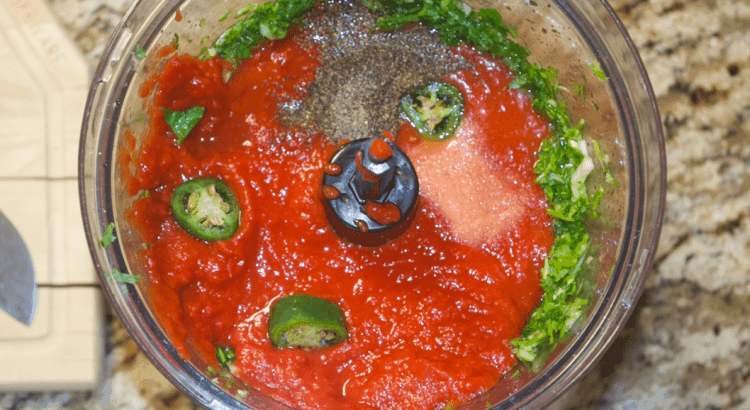 I like to use canned crushed tomatoes as my base for this homemade salsa recipe. I have found that it adds depth to the flavor by minimizing the natural water added. A few years back I planted one jalapeño seed and it sprouted right up into mega producing machine. I could have made enough salsa to feed a country so I stuck them in my freezer. I pull one out for each batch of salsa and it takes a bit of the heat out of it. If you use fresh jalapeño and don’t want as much heat, make sure you remove the seeds. I like to use Himalayan pink salt for all of my food but you can use any salt you have on hand. The reason I prefer the pink stuff is because it contains 84 trace minerals. Table salt undergoes chemical processing and bleaching which strips away their nutrients. 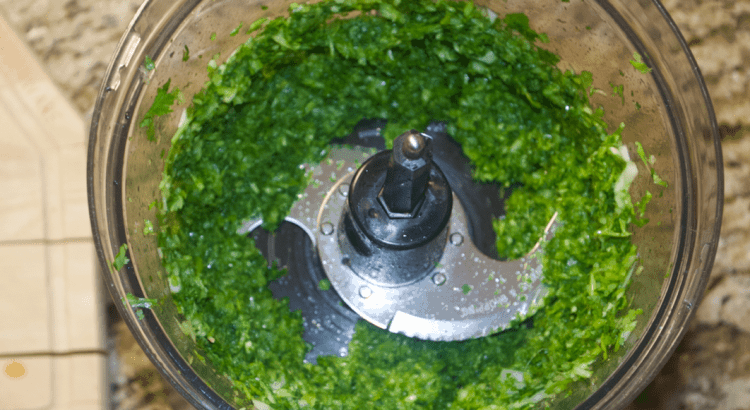 After you wash and shake out the cilantro, spread it evenly on the bottom of a food processor. Peel both the garlic and onion and cut onion in quarters. Place them on top of the cilantro and pulse on high for 30 seconds. Scrape down the sides and pulse again for 30 seconds until the mixture resembles a course paste. Add the entire can of tomatoes to the food processor, 3 tbs of white vinegar, jalapeño, salt, and pepper, and pulse on high for 30 seconds or until well combined. Now its time to taste the salsa! You can add more jalapeño if you are a heat lover. This is one of those recipes that you can play with, adding more salt, pepper, garlic, etc according to your own personal taste. The salsa flavors marry each other over the next day or two in your fridge. I do not recommend eating this salsa if you are going out on a first date or a job interview because there is absolutely no way to hide the smell! This salsa tastes better with each day it’s in the fridge! Wash the fresh cilantro and shake it dry. Peel and quarter onion. Peel garlic. 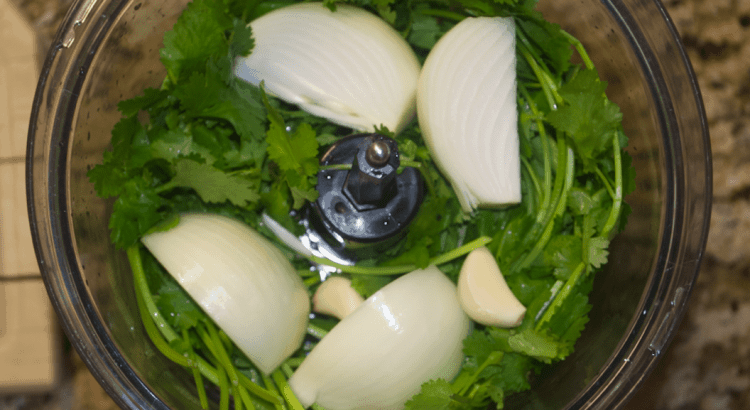 Place the onion, cilantro, and garlic in food processor and pulse on high for about 30 seconds. Use a spatula to remove ingredients from the side and pulse again on high for 30 seconds until well chopped. Add entire large can of crushed tomatoes, vinegar, salt, pepper, and jalapeno to the food processor and pulse on high for 30 seconds. Serve with favorite salty dipping snack and enjoy!